A BEAUTIFUL CITY BILLBOARD FEE? If I asked those at city hall to allow me to put megaphones on almost every major corner, blaring manipulative, sexist[i] and other base messages 24/7 – you can bet that I would be laughed out of building… So, for those who cherish the visual aesthetic of our streets, what happened? The relentless assault of commercial advertising litters our city to no end (see illegal DVP ads below.) As a progressive society, we need to ensure that proper controls are implemented to balance these messages. Not only to enhance the beauty of our city, but to ensure diverse communication in public space. Clearly, we cannot rely on the industry to self-govern to our benefit. The clients of billboard operators have to spend increasing amounts of money to maintain exposure, recognition and penetration. This is because of competitive tactics that eventually lead to over-saturation. Once a billboard goes up, it detracts impact from other billboards around them. [ii] The main response to these diminishing returns has simply been more advertising; resembling something like an arms race – only run by market forces. Companies engaging in billboard advertising must be held accountable to the public for their access to - and impact on, public space – the alternative is them continuing their mindless race to the bottom, covering every surface in a meaningless mess. One solution to this end is a tax, or annual permit fee, where the proceeds would be redirected into public art. This "Beautiful City Billboard Fee" (BCBF) could use the existing municipal infrastructure for tracking and collecting permits and/or variances for third party outdoor signage into an annual payment structure. These funds would be paid into the Public Art Reserve and then distributed through public arts councils or directly to community centres. Typically, we agree with advertising in other forums such as magazines, as it is seen to subsidize useful or enjoyable content for the consumer of the message. Very little has been done to achieve this end in regard to billboards. Accordingly, access to visual communication in public spaces needs to reflect the creativity and multiplicity that exists in Toronto – less this we alienate our population from their environment. Public art physically enriches and contributes to our communities. [iv] It improves our quality of life; it can tell us of our past, represent our present and foreshadow our future. Additionally, when produced locally, public art contributes to ‘place making’ and can serve to reinforce multiculturalism. Billboard advertising is typically the polar opposite, by motive, medium and methods. Billboards also undermine the perception of public ownership, whereas localized projects enhance it: Thus the BCBF works as a remedial act – enabling and spurring people to further add to their communities in a positive format. This tax or fee, will not only help beautify our city, support diversity and provide employment for our systemically underemployed artists[vi]: It will also help save billboard advertisers from themselves. The fee will help billboard advertising to assume a more legitimate place in the public’s perception. Spin-off effects could include a reduction in vandalism (on advertising) and people paying more attention to billboard advertisements. As a theory: If citizens began to look at billboards as public assets rather than (at worst) manipulative blight – the need to saturate would be reduced as value associated with impact went up. This would primarily be of benefit to the clients of billboard operators. However, unless the operators adapted, their economic growth could be stifled. Fortunately, BCBF could also allow opportunities for billboard clients and operators to build more genuine, long-lasting relationships with local communities: Representatives of billboard operators and/or advertising firms could be invited to sit on the peer review boards as a positive outlet for their visual acumen. The support of clients[v] could be also acknowledged on a small plaque near (and physically separated from) each installation or mural. The billboard operators and advertising firms could become brokers of this process by selling, ‘Recognition Spaces’ on these plaques at a set price to clients. Hypothetically, at a charge of $6.00 per sq. foot of billboard space, redirected towards public art per year - five 15’x25’ billboards could subsidize one small art piece for the cost of $10 000.00 (as well as $1250.00 for administrative and maintenance expenses incurred by city and granting bodies). At a grander level, the 5000[vii] billboards in Toronto will generate six million dollars for public art per year. 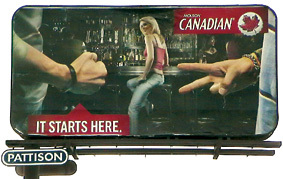 One of the less popular, yet ad industry appauded Molson's billboards. An illegal/without permit 'spectacular' on the DVP, June 2005. [v] Under the assumption that the additional cost will just be passed on to the clients. [vii] Estimate from the Canadian Outdoor Measurement Bureau at an average size of 10’x20’.